Hero Defense is a game you’ll immediately be wary about. Make no mistake about it, it’s an incredibly fun game, fusing the tried-and-tested tower defense gameplay with RPG-lite elements and traces of real-time strategy. But, when you cut it through the middle, it bleeds the blood of a mobile game, which makes the $30/£25 price point leave a seriously bitter taste in the mouth. No matter how compelling the game gets in the six-to-eight hour run time, Hero Defense is a shallow mobile game set on the grand stage of the PS4. It does try and stand out from the pack, however. Developer Happy Tuesday presents a solid-if-unspectacular take on the tower defense format, but one in which you control five heroes whom can move freely around a map, desperately trying to protect an objective being breached by onrushing waves of enemies. The first hour or so starts off deceptively simple, but, as the game settles into its groove, the maps start to become more complex with multiple branching paths and verticality. As a result, combining heroes’ strengths and weaknesses together is the only way to grab victory. The heroes themselves reflect the game’s hits and misses well enough. There’s Jack—son of villain Count Necrosis—as well as Barrows, Sam, Jane Doe, and Wylde. Their personalities boil down to tired stereotypes (son of the villain, kooky old man, headstrong child, and so on) and the repetitive soundbites will grate more often than not. Then there’s a glimmer of hope; the rag-tag quintet actually blends pretty well and, by the game’s end, form some sort of quasi-family unit that, if you’ve not grown to love, then you’re certainly able to tolerate. Which is something. However more depth is required to dispel the nagging feeling that you’re playing a mobile game. Jane Doe’s allusions to spousal abuse, for example, are weirdly relegated to boss battle banter, which isn’t a good look. While you may be forgiven for thinking this is a title better off drifting around the mid-twenties on a free-to-play App Store ranking with its generic name and cookie-cutter protagonist, it can absolutely get its hooks into you. When it does, around the halfway mark of the campaign, it turns into a pretty compulsive experience, despite its mobile game-esque vibe. The aforementioned waves of enemies each come with different tactics required to take them down; Skeletons, for example, may need Barrows on board, yet do you partner that with Sam’s area-of-effect flame damage or Jack’s punchier crossbow? The game shines within strategy. Shrines, which boost everything from power, to attack range, to the speed of your hero, and additional attacks (fire and ice bombs, poison, and a “Scare” move that drives waves back in droves) ensure that no two waves are ever the same. Unlike some tower defense games that can be sleepwalked through, this is a title that requires you to be switched on at all times. 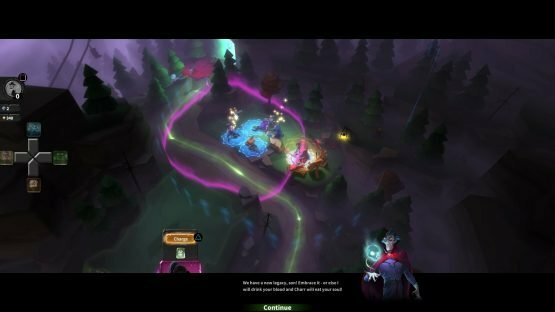 When it all clicks and there are several waves piling in and, despite mercifully including a pause option, you need to make a split-second decision, there’s very little around as pulsating as Hero Defense. But those moments are, admittedly, few and far between. 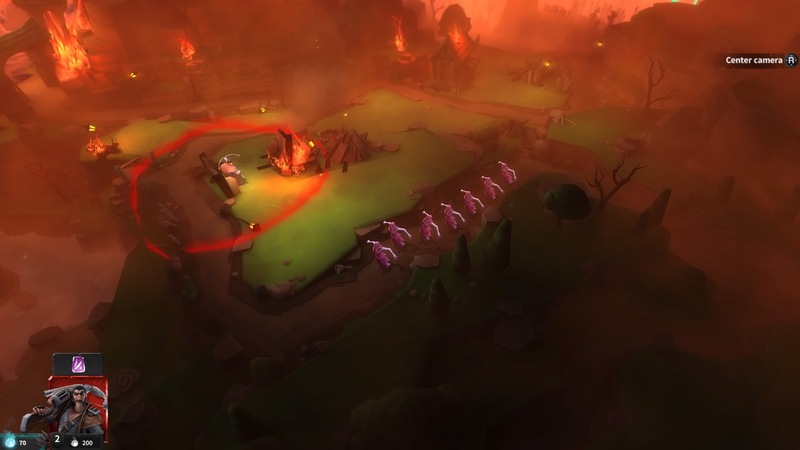 Grinding is the name of the game for much of Hero Defense’s fifteen-level long campaign. Coins and gems must be earned to upgrade weapons and equip runes in the Forge, while the Academy’s meager skill tree lets you power up each hero as you see fit. So far, so very ordinary, though there is a spark of ingenuity where you must think very carefully about which Shrines you’re going to place down in a map. They’re there to stay and can’t be replaced until you’ve coughed up enough gems to replace them. It’s still not enough to redefine the genre (Happy Tuesday is very intent on playing it safe), though it’ll stop you from simply mashing fast-forward on waves once the going gets tough. Its story too—if you want to call it that—adds very little to proceedings. Each hero has a nemesis that crops up as end-of-level bosses, but it’s Jack’s hunt to take down his father, the heinous vampire Count Necrosis, that takes center stage. Not even an enthralling final chapter—featuring a potential 65 waves—as you try and defeat Necrosis on his gloomy home turf will make you feel committed to driving forward with Jack and the gang. In fact, going back through old levels on harder difficulties and gaining stars is very much the only thing that’ll keep you going. A deep, layered metagame, this ain’t, but it’s nice to see your heroes progress meaningfully as you polish off a difficult level you once thought impossible. Despite that, it only adds another two hours onto the game, max. All in all, I’m not sure I’ve been as conflicted about recommending a game. As disingenuous as it may sound—especially as Happy Tuesday has clearly put in the hours when it comes to making sure everything is finely-tuned, despite some janky animation and lackluster sound design—this feels like a game that you’ll be buying during a sale several months down the line. It’s simply not long enough, not deep enough, and not cheap enough to warrant a second look just yet. What is there undoubtedly works, but you half expect an advert to pop up asking you to buy more gems via a credit card, like a beggar with hat in hand. If a game is giving off that sort of vibe then, more than not, it’s bad news. I want to like Hero Defense, I really do (and I had a great deal of fun playing it in patches). But the price point is almost inexcusable at this moment in time, especially when you can purchase the likes of No Man’s Sky for a cheaper price than the $30 they’re asking for something you’ve already seen dozens of times on the market. This is an average game wrapped up in an abysmal marketing choice. Avoid for now, just be sure to give it a second look if it hits an amount you’re willing to pay. Hero Defense review code provided by publisher. Version 1.00 reviewed on a standard PlayStation 4. For more information on scoring please see our Review Policy here.